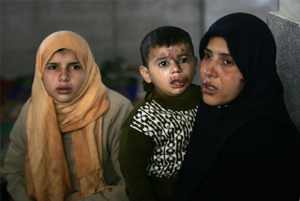 The ongoing Israeli military offensive is further deepening the humanitarian crisis facing the people of Gaza. As fighting between the Israeli army and Hamas militias has intensified over the last two weeks, the impact on civilians is appalling, with innocent women, men and children being killed and injured. For people living in Gaza, four out of five of whom were already largely dependent on food aid, this comes on top of 19 months of blockade. They now have little or no access to clean water, food or power. Medical and sanitation systems are also on the verge of collapse. We’re calling on the whole of the international community, particularly the UK Government and the EU, to do everything in its power to secure an immediate and comprehensive ceasefire by both parties, so that vital humanitarian assistance can be delivered, civilians on both sides can feel safer, and negotiations for a long-term solution for both communities can restart. Since the conflict started we have had to put our ongoing programme in Gaza on hold; our staff, and the staff of our partner organisations, are sheltering while the bombardment continues. 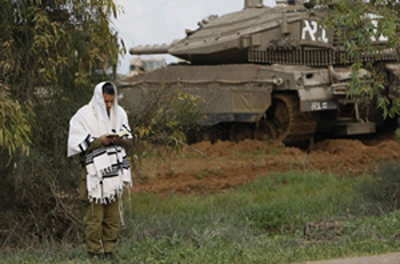 An Israeli soldier wearing a prayer shawl prays near a tank as troops take position on the Israeli-Gaza Strip border on December 30, 2008. Our programmes include ‘cash-for-work’ providing paid employment to agricultural communities, food vouchers which provide locally-grown fresh produce at fair prices, and work improving public health by helping maintain clean water supplies. Programmes such as this help markets to stay functioning and keep people healthy. We will respond to the increased needs arising from this latest crisis as soon as it is possible. We are planning to meet people in Gaza’s immediate basic needs through distributions of food, water, hygiene kits and non-food items. We will work with our partners and local communities to rehabilitate damaged parts of Gaza’s water and sewage network.